You’ll be surprised just how much you could benefit from hiring a skip for your home renovation or refurbishment project- why not let Skips Preston talk you through the basics of Skip Hire Preston? Whether you’re moving to a new home or simply looking to remove excess junk from your property, we can help you to find a suitable solution that meets and exceeds your unique requirements. The main problem with any project isn’t necessarily the removal process but the cleaning up process. No matter what work you’re undertaking on your property, there can often be a significant amount of waste generated but Skip Hire Preston allows you to keep this to a minimum. What are the benefits of skip hire? Skip Hire Leyland provides you with a convenient way to get rid of unwanted waste, saving you time and energy. When removing waste from your property, we can take care of the disposal, ensuring that it’s efficient and sustainable. Leaving your Skip Hire Leyland to the experts who have the competence to work efficiently can provide you with the peace of mind that you need, making sure that your project requirements are met. When it comes to finding Skip Hire Leyland or Skip Hire Wigan, you’re in capable hands with the team of experts at Skips Preston! Skip Hire Wigan is a great investment to make if you’re looking for a sustainable solution for disposing of waste. As with any of our waste disposal services, Skip Hire Wigan is guaranteed to provide you with a smooth, hassle-free service; can you afford to miss out? Instead of worrying about having to handle waste manually, Skip Hire Chorley is a far safer alternative! Choosing to hire one of our skips for your Skip Hire Chorley will allow you to eliminate the risk of hazards on site, ensuring that waste materials are stored off the ground and out of harm’s way. With Skip Hire Chorley, not only do you have the opportunity to choose a suitable skip, you can also benefit from the expertise of our team of professionals who can make it much safer for you. Finding affordable Skip Hire Bolton is made easy with the help of Skips Preston! We can help you to find the most suitable skip for the type of waste your project will generate, providing you with more than enough space to store unwanted materials safely. Each of the skips supplied for Skip Hire Bolton is priced affordably, offering suitability for an array of budgets. Who can benefit from skip hire? 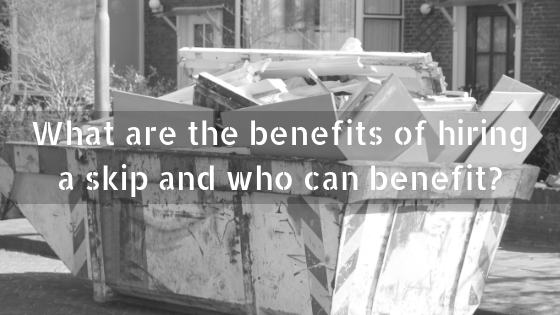 There’s no reason to say why you cannot benefit from skip hire! We provide skips to suit the requirements of an array of customers, making it easier for you to find something suitable for your unique project. To determine whether skip hire is right for you; you’ll need to decide what type of work you’re undertaking and which skip will suit your needs best! Here at Skips Preston, we provide a complete range of domestic skips that are suitable for all projects. Depending on the type of waste your project generates, we can supply you with a domestic skip that is guaranteed to hold waste materials safely. Although the domestic skips are tailored more towards DIY and renovation projects, they are surprisingly spacious and are suitable for bulky appliances that can be incredibly difficult to store. If you’re looking for something that offers more space, you cannot go wrong with our Roll-on Roll-off skips! These are specifically designed to transfer objects with ease, making light work of handling heavy items and reducing the need to hire an additional domestic skip to fit all of the waste from your project. The commercial skips are ideal if you expect your project to generate a substantial amount of waste, however, these cannot be filled with large, heavy or bulky materials as this will make it almost impossible to lift onto the back of our loading vehicles.